I'm generally quite picky about what I choose to review, and the majority of things I do say yes to are for Chick. She is one very lucky girl, (as her bursting at the seams bedroom will attest too) but she has one true love in the world which is stationery!! If you tell her that she can roam the aisles in WHSmith just looking at paper, pens, folders and rubbers then she is a very happy girl..... and if you let her move onto the book section or actually buy her stuff then it makes her weekend!! So colourful and lovely!! We got a really cool pen that has some kind of mini slide show on top, a little figurine and a folder.....which will be useful for keeping the reams of paper in that my lovely girl writes on every day!!! The blurb: Monopoly is the classic property trading board game. It’s the game about dealing in big money and getting rich quick! Swipe your bank card to transfer money - it couldn’t be easier! Starting from the famous “GO” space, move around the board, buying and selling properties, building apartments and hotels as you go. Watch out for players landing on your property – they owe you rent! And don’t forget to collect £2,000,000 every time you pass “GO”! That’s right, £2 Million… on your Bank Card! The places have changed to reflect the real London of today that we all know and love – from Bishopsgate to Kensington Palace Gardens. Choose from a range of new movers including a mobile phone, roller blade, or even a cheeseburger! 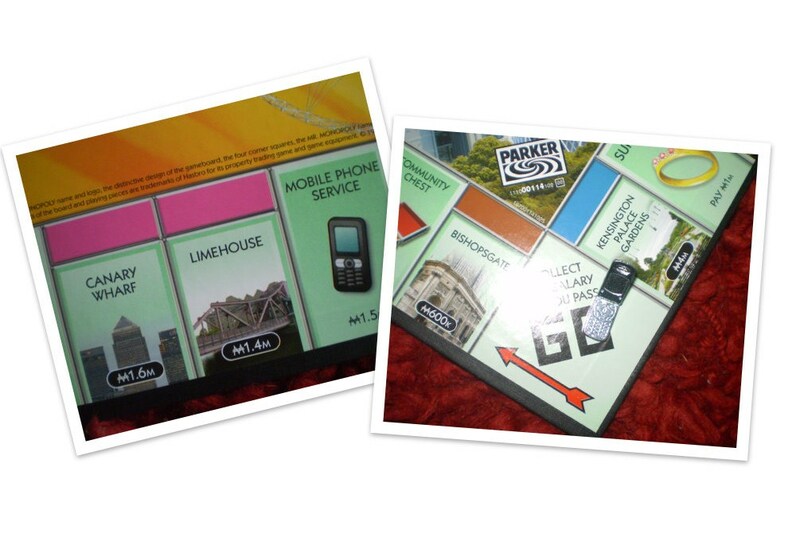 I’m a firm believer that every family should own at least one version of Monopoly. It’s great for some good old family rivalry and also for use during power cuts!!! Being able to collect rent from the properties.....bring it on. Collecting £2 million every time you pass go!!! I like having so much money! There is no cash!!! What?? 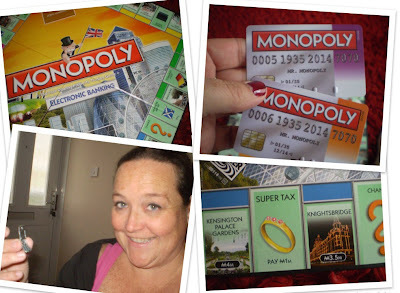 The fun of Monopoly for me is getting everyone else’s wads of cash! A bank card just doesn’t give you the same thrill!! However that may just be me as Chick doesn’t appear to be unduly bothered! Updated counters....I’m all for a bit of moving forward but I much prefer the dog and the top hat to the skateboard or mobile phone! The only extra thing that you need is two AA batteries to make the cash machine work. Aimed at ages 8+ which I feel is right. Obviously younger children can play with some help and guidance. Available from Toys R Us at £21.99 and thoroughly recommended for Christmas! Chick has loads of Jelly Kitten stuff from when she was younger and even though it’s been played with a lot it’s all still in great condition. The giraffe is the sweetest thing and comes with a Velcro loop to hang it from a pushchair or cot. 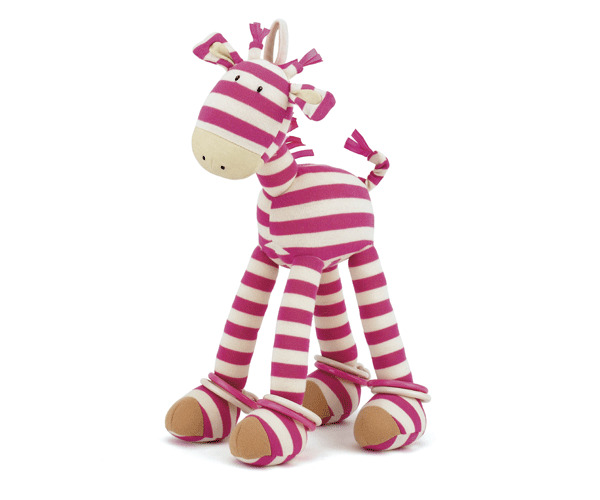 It also has two rings on each foot that make a clinking sound which little ones will love. Looking around the website there are hundreds of products to choose from and all the big names are there too including Phillips Avent, Tomy, Little Tikes, Polar Gear, Tutti Bambini and Safety 1st to name but a few. Even better is that delivery is free on orders over £50 so you don’t even need to leave the comfort of your lounge! 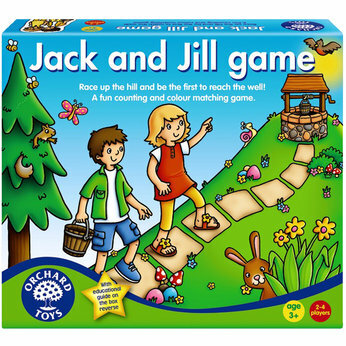 The blurb: Race up the hill and be the first to reach the well in this fun Jack & Jill counting and colour matching game. Roll the dice to climb the hill and be the first player to reach the well to win the game. But be careful, spin the spinner and you might fall down to the bottom and have to start all over again! This game is a perfect board game for younger children. It’s bright and colourful and easy to play. It also has different levels of the game so you play either by colours or by numbers according to your child’s development level. Available to buy instore or online from Toys R Us at £8.99. The Blurb: Are you ready for the Shark Attack? Players scramble with excitement and fear as they roll the dice looking for their colours. 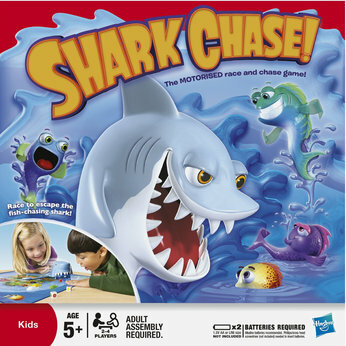 The motorised shark chomps and chases all the fish around the game board! Each player tries to out-swim the shark and their friends to be the last surviving fish to win the game! Suitable for 2-4 players. It needs 2 AA batteries so isn’t too expensive to run. 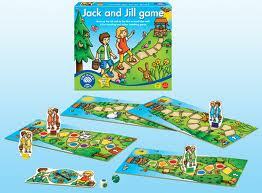 It’s aimed at ages 5+ but smaller children could definitely play with a bit of help setting up the game. The only downside from my point of view is the price. I think for what it is £19.99 is a lot of money. Having said that however we have played with it quite a lot and Chick likes it and would give it 4 out of 5. Available online or instore from Toys R Us. Don’t forget to check out all the fabulous review over on the Toybox before you think about buying the kids Christmas presents. Do you fancy winning a couple of new toys in the run up to Christmas??? We just received the last Toys R Us Toyology box for this year (booooo hiss) and I have two great prizes to giveaway.....one today and another tomorrow!! Pinypon loves to travel! She loves to visit all the trendy cities - such as New York and Paris and it's much more fun when you travel with a friend! There's so much to see and do. Sets are available from Toys R Us instore. To enter all you need to do is check out the Toys R Us page on Facebook and have a look around at the amazing reviews in the Toybox and then leave me a comment here letting me know that you've done so. Closing date is Sunday, 27th November at 5pm. As I mentioned over on the main blog yesterday I have FOUR copies of Susan’s latest book to giveaway which isn’t even released until Thursday!!! She was only nine when her world fell apart. The struggle to understand took a lifetime. In 1960s Bristol, Susan's family was like any other with its joys and frustrations, and fierce loyalties. Then tragedy struck and left a legacy that was to last a lifetime. Susan was only nine when her mother died. A year later she was sent away to school. She didn't want to go, and didn't understand why she had to. In her struggle to cope with an uncertain world - a world where nothing seemed to make sense any more - she pushed away the one person she loved best, her father. It wasn't until adulthood beckoned that she realised that, in order to turn their relationship around, she had to learn to love - and trust - again. To enter all you need to do is pop over to Susan’s Facebook page and say hi and then leave me a comment below letting me know that you’ve done so. Closing date is Sunday, 13th November at Midnight and winners will be chosen at random after this time. Good Luck! !